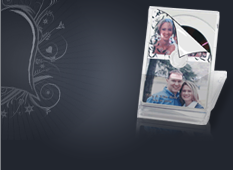 At Memory Maker we will customize the rectangular video CD party favor given to your guests. When the guests come up to the photo video booth the attendant will encourage the guests to get a party favor. Our software allows them to take up to 3 fun photos and then select the best picture to be combined with the hosts theme on the rectangular CD photo sticker. The attendant then affixes the customized photo sticker label on the CD party favor. The theme of the party favor is done in advance of the wedding event. Simply e-mail an engagement photo(s) and we will customize the look to your specifications. Have a look at our slide show below to get different ideas to customize your theme. We also offer a variety of frame borders to go around your guest photos. With every party favor your guests will also get 2 extra photo stickers. One of those photo stickers can go into a guest book that you provide us.